The combination of the stripes, dots and flowers is so pretty! I stencilled my stripes, then stamped and fussy-cut my spray of roses. I added a punched dotty strip and my sentiment, and some sequins for a little sparkle. I'm guessing my card would be considered Clean and Layered. 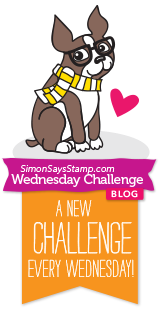 Welcome to our most popular challenge at the Simon Says Stamp Wednesday Challenge! Our theme this week is your favorite Anything Goes, and the Design Team are using Prima products. Prima makes everything from their well-known paper flower collections to stamp sets and papers and everything in between! I have 2 very different cards for you this week. to the fabulous Simon Says Stamp Superstore for 1 lucky random winner of our challenge this week! City Crafter Challenge Guest Designer! The City Crafter Challenge is celebrating its fifth birthday all during April, and each week we get to CASE a different designer's card. This week, it's Stella! As a winner of a past challenge, I was invited to be a guest designer this week! I did 2 cards, using Stella's sketch, and changing up the colors, using a spring pastel theme for both of them. 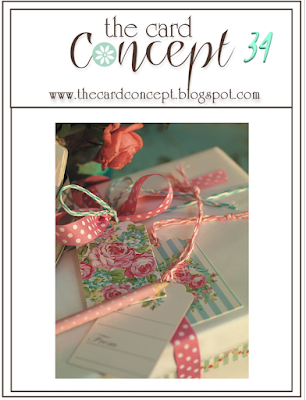 I love the combination of stripes and florals, and mixed these together on both my cards. Thanks to the City Crafter ladies for having me as a Guest Designer this week! Today I had a memory of my Aunt Betty and a very young me sitting in the woods picking violets and finding a yellow one. I don't think I've seen a yellow violet growing in the wild since, so this is a special memory for me. My Aunt passed away several years ago, in her late 80's, and it's amazing how various memories float up every once in awhile. She had no children of her own, so she spoiled all of her nieces and nephews and made us each feel special. I also remember picking violets and making a little bouquet like this, surrounded with their leaves, for my Mom or Gramma in the spring - I still have a patch of purple violets in one of our gardens, and enjoy picking the tiny flowers to bring inside and put in a small vase.....they have a lovely soft smell! She had the most beautiful blue eyes, like her father, and her brother, my Dad, so I chose to accent this with some touches of blue. I miss you, Aunt Betty! And since I've used a die-cut and my Spectrum Aqua Floral and Essential markers, I'd link to enter the Spectrum Noir April challenge. Thanks for stopping by - hope you're having a great weekend! I die-cut a bunch of these scribble flowers from white, and just one from a pink mettalic sheet, added some green cardstock leaves and filled my panel with them. That panel was cut down a bit, framed with pink, and popped above my card base. The sentiment is from their Flower Fusion #12 stamp set, using VersaFine black and picked raspberry distress inks. I also added a single pink enamel dot to the center of the flower. I'm really pleased that this one turned out exactly as I meant it to! Today's the day that Simon shows us it's newest release called Falling for You! Being a former curly head, and having a granddaughter who inherited those curls, I think this set is so darling, and there are so many hearts in it, also! The images are simply done, so they're very easy to paper-piece as I've done, or color in using your favorite medium. There are a mix of cute fonts, too, so this set hits all my buttons! Hurry on over to Simon Says Stamp to see all of the new things that are being released today! 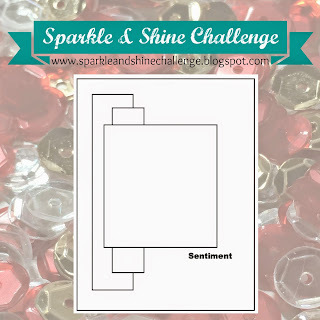 It's Wednesday, and that means another challenge begins at the Simon Says Stamp Wednesday blog! This stamp highlights the negative image, so the background and the details of the flowers and leaves get stamped. In this case, I used black ink and embossed it in clear, then colored in my details with distress inks and markers. to our fabulous Simon Says Stamp store for one lucky random winner! I promise this will be my last Build a Bouquet creation for awhile, but I wanted to put all the flowers in the set together. This time I smooshed some tumbled glass distress ink on my kraft sheet, spritzed it with water, and then pulled a panel of watercolor paper through it to get this pretty blue background. I added colored and clear sequins for some sparkle, and stamped my sentiment on a strip of vellum. 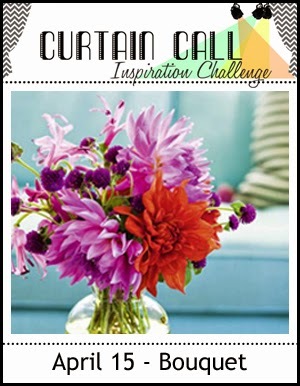 Once again, adding this to the Curtain Call challenge: Bouquet. I'll enter this into the current Curtain Call challenge. The cue word for this week's CASology challenge is sweet. My mind went immediately to fresh juicy strawberries, and I used a stamp that I won years ago and have never used. Many, many years ago, when I was more into gardening than stamping, I planted a little grouping of alpine strawberries, which are teensy-tiny little things, but just as tasty as their big sisters. Over time, that patch has disappeared, but, I still find individual plants popping up here and there all over our gardens! They are a joy to discover each year! I stamped the berry sprig and sentiment on my white background, then cut out a red label frame and glued it around the stamped image, rounded the corners and attached it to a red card base. of one of the new stamp sets being released next Thursday, April 23, at Simon Says Stamp! The release is called Falling for You! I have been watching and waiting for the Stampendous Build a Bouquet cling stamp set to order it - it has been sold out everywhere since CHA, it seems! Last week it popped up for a mini-second at Simon Says Stamp, and I dropped everything and ordered it. Had a play today and I am SO pleased with it! I white embossed, watercolored, and fussy-cut the flowers and leaves from watercolor paper, but the vase I stamped right onto the background panel and carefully watercolored it in. Then I played with my flowers and leaves until I had an arrangement that pleased me, and then I glued them down. I think these flowers are meant to be hydrangeas, but here and at this time of year, they make me think of 2 little handfuls of violets. When I received this adorable Sunflower Sweetheart from My Favorite Things, I stamped her several times and colored her in various colors. Thought I'd use one of those to play once again in the Bonus sketch challenge, with a sketch from Page Maps. supplies: MFT Sunflower Sweetheart (image and sentiment) and Stitched Tag, dps from Echo Park's Hello Summer, washi tape and fabric tape, Doodlebug bumblebee twine. Our theme this week is "Make Your Own Background"and the Design Team are using My Favorite Things products. If you have any of their products, we'd love to see you using them, too. I made 2 cards today using their stamp set called Sunflower Sweetheart. I had this little cutie carry a daisy, and then used the Petal Pattern stencil to make daisies for my background. 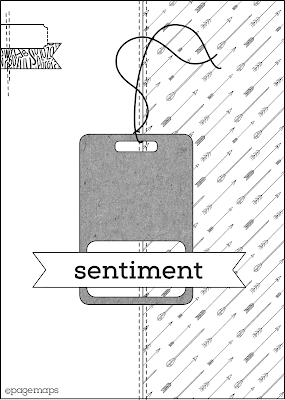 The sentiment is one of 5 in this set. For my next card, I used the sunflowers from the stamp set and stamped them repeatedly to make a background, then overlaid that with a sheet of vellum to soften them and then added the little girl again, this time with the fence from the set. We have a $50.00 gift voucher for the random winner of our challenge, that can be used at our fabulous Simon Says Stamp store!